Manchester City Council’s draft budget proposals have been published, completing the three year budget commitment for the period 2017/18 to 2019/20. Despite funding pressures, the Council is on track to meet the three year plan, which was agreed following the large-scale consultation with residents to understand what mattered most to them. Residents have told us that the things they valued most were care and support for vulnerable people, helping families in poverty, tackling homelessness, improving access to jobs and training, upgrading our roads and ensuring our neighbourhoods are clean and well managed, and leisure investment to keep people active and happy. - Additional investment in Children’s services of £13.6m, £10.8m more than the £2.8m agreed in the original budget to help support the city’s most vulnerable young people and ensure our children get the best start in life. - Additional investment for Adult Social care of £11.4m, £7.6m more than the £3.8m agreed in the original budget. - £4.3m extra funding to support homelessness services, in addition to the £250k in the original budget. - This includes an extra £0.5m for enhanced enforcement in the Private Rented Sector that supports homeless families. - Highways continue the £100m improvement programme with major schemes coming online this year, including £1.7m on repairing pot holes. - Major refurbishment of Moss Side Leisure Centre is now complete. - Council built affordable homes have been completed in north Manchester, while empty properties in east Manchester (Ben Street) have been brought back into use. - Longford Centre in Chorlton opened to support residents vulnerable to becoming homeless. The City Council has the opportunity to further increase the Council’s element of the bill by 1%, but will keep the 3.49% level (1.99% Council Tax and 1.5% Adult Social Care) as this is what was agreed with residents at the outset of our three year budget promise. 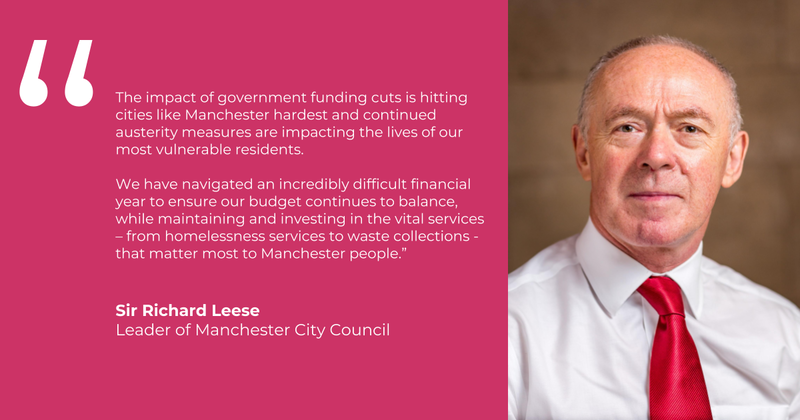 This is also in recognition that both Mayoral and policing precepts – parts of the overall bill which fund non-Council services - are expected to rise, so the Council is doing what it can to limit the impact on residents while maintaining services.